How to operate and maintain the CNC lathe? The operator needs to have a complete understanding of the operation of CNC lathes. Understand the mechanical structure of the lathe: to understand the mechanical composition of the lathe; to master the distribution of the lathe shaft; but also to firmly grasp the positive and negative directions of the various numerical control axes of the lathe; to grasp the function of the various parts of the lathe, such as the principle of the simple pneumatic system, simple hydraulic System operation principle; In addition, it is necessary to master the working principle of various auxiliary units of the lathe, such as the working principle of the tool magazine, cooling unit, voltage regulator, electrical cabinet cooler, etc., and the function usage method, and the working principle of the various safety locks of the lathe. Function usage method. To master the control of CNC lathes manually or automatically, master the control of the lathe CNC axis movement. The operator must reach the realm of perfection, so that it can be done freely under any circumstances; only in the event of a collision or failure, the operator can correctly and timely deal with the problem, and the operator will form a conditional reflex and take measures decisively. Move means. To master the program, various process parameters are compensated for tool or wheel diameter length compensation. First, after training, you should master the programming language of CNC lathe and the compensation methods for each parameter of the programming method. Most modern CNC lathes now have a programmed or simulated PC workstation. So beginners can first perform software editing lathe cutting simulation learning on the workstation. Fourth, the actual processing process processing skills, and do a good job of preparation, first read the drawings, confirm that you want to process the workpiece position, to confirm the accuracy of the workpiece parts to be machined tolerances, and then edit the processing program. To prepare the tool or grinding wheel for machining, prepare the inspection tool for the machining process and prepare the auxiliary tooling jig for the machining process. CNC vertical lathes are advanced equipment with excellent performance, wide range of processes and high production efficiency. Based on advanced domestic machine design and manufacturing technologies, the company uses the latest design concepts and combines with the deep corporate culture to develop a precision machine tool that integrates electromechanical hydraulics. The following is a summary of the maintenance and maintenance of CNC vertical lathes. We hope to help you. First, check the electrical, hydraulic, lubrication, and operating systems. Second, check the operating conditions from low to high levels of speed and the idle travel of each moving part. Thirdly, in the initial 200 hours of use, the weight of the workpiece should not exceed 50% of the allowable load of the table, and the maximum two steps of the table should not be used. 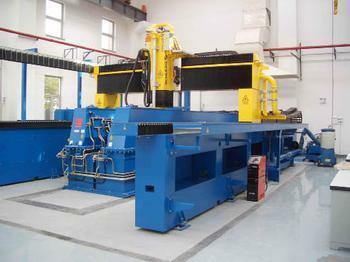 The cutting force should not exceed 50% of the maximum cutting force. The iron plate should not be over-tightened and the ram should not extend too long. Fourth, change the oil once after the initial operation for one month, and then change the oil once in three months or six months. First, pay attention to check the position of the handle before driving, and if the jaws clamp the workpiece. Second, check the cleanliness of the rail lubrication. Third, check whether the signal light and the interlock device are sensitive and reliable. Fourth, check whether the moving part enters the limit position and whether to loosen the screw before moving. Fifth, when the worktable is not stopped, no mechanical transmission is allowed. However, the feedless movement and the stepless speed regulation of the main movement can be adjusted as needed. Sixth, when lifting the workpiece, it is necessary to stop the parking of 80 oil pump motors first, so as to avoid sudden lifting of the workpiece, the instantaneous oil pressure suddenly rises, damaging the feedback valve pressure gauge. Seventh, the tool must not be stopped before exiting. When the machine tool is packaged and the long-term storage period is maintained and maintained at the time of packaging and long-term storage, the exposed processing surface should be coated with anti-rust agent. If the oil seal period exceeds, the oil seal should be re-sealed.